The Future of Swing We are pleased that The Jazz at Lincoln Center Youth Orchestra (JLCYO) played the opening 45 minute set at the Savoy Ball at the Edison Ballroom on May 23, 2014. This is the first year for the JLYCO program, with 20 talented and dedicated high school students from the tri-state area. They learn big band repertoire and performance techniques from JLCYO Director Vincent Gardner, Wynton Marsalis, and other members of the Lincoln Center Jazz Orchestra. This year they have played at Carnegie Hall and Dizzy’s Place. Drums Zachary Adleman, Saudy Familia. Jazz at Lincoln Center Youth Orchestra and Dancing Classrooms at Frankie’s Centennial Savoy Ball May 23, 2014, NYC on Vimeo. Following the JLCYO, the Ball will feature the 17-Piece George Gee Swing Orchestra with vocalist Hilary Gardner and John Dokes. Frankie always said that “it is all about the music” and for the Lindy Hop to remain vibrant, we need the energy of new young musicians. We hope that Frankie would have been delighted to have these young musicians. The JLCYO, collaborating with professional artists and a choir of high school singers from New York City public schools, performed sacred music by jazz legend Duke Ellington at Carnegie Hall’s Stern Auditorium/Perelman Stage on Sunday, March 23, 2014 and have also appeared at Dizzy’s Club. The Jazz at Lincoln Center Youth Orchestra (JLCYO) consists of 20 talented and dedicated high school students in the tri-state area (NY, NJ, CT). Members have the opportunity to enhance their musical education with the finest professional training and performance opportunities. The JLCYO rehearses weekly in the state-of-the-art Frederick P. Rose Hall, home of Jazz at Lincoln Center. During these rehearsals, students learn big band repertoire and performance techniques from JLCYO Director Vincent Gardner, as well as members of the Jazz at Lincoln Center Orchestra and Jazz at Lincoln Center’s Managing & Artistic Director, Wynton Marsalis. For the Savoy Ball performance, the JLCYO will be led by Matt Butterman. 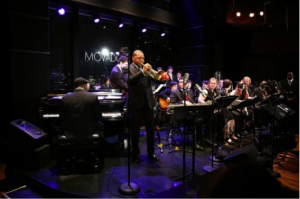 Movado Group, Inc. serves as the lead sponsor of Jazz at Lincoln Center Youth Orchestra’s (JLCYO) inaugural concert series. 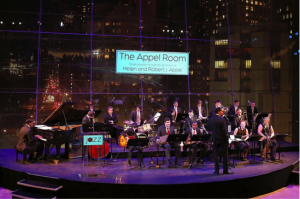 Do not miss the 2014 Essentially Ellington Competition & Festival to be held May 8-10, 2014 at Rose Hall, another youth program of JALC. The annual Essentially Ellington High School Jazz Band Competition & Festival is one of the most innovative jazz education events in the world. Each year, high school musicians from across North America travel to New York City to spend three days immersed in workshops, jam sessions, rehearsals and performances at the “House of Swing,” Frederick P. Rose Hall, home of Jazz at Lincoln Center.